UofL and KentuckyOne Agree to Extend Their Academic Affiliation Agreement Another Four Months. Barely within the statutory requirement for a response to an open records request, I received two critical pieces of the new contractual agreements between the University of Louisville and KentuckyOne Health that extend the current terms of their Academic Affiliation Agreement (AAA) and Master Support and Services Agreement (MSSA). These documents define the conditions and financial arrangements between the institutions for another four months with an option for automatic renewals. The extensions give some breathing room to the organizations currently working behind the scenes to determine the future of KentuckyOne’s operations in Louisville and simultaneously protect the ability of UofL to place students and trainees at Jewish Hospital and Fraser Rehabilitation Institute while simultaneously allowing Jewish Hospital (and Sts. Mary & Elizabeth) to maintain their status as a teaching hospital for Medicare purposes. The extension of the agreements was, as I argue previously, critically important for the integrity of the two institutions. Obligations to students, trainees, and patients alone are manifestly inviolable. I commend KentuckyOne for shouldering its responsibility which will certainly present challenges. Its parent organization, Catholic Health Initiatives (CHI), has been under financial stress for some time and which I suspect has complicated its intended merger with Dignity Health anticipated at the end of this month. The long-sought goal of CHI to sell QualChoise, its poorly performing health insurance division, was recently announced and which may give the corporation some temporary room to maneuver financially. As desirable as the extensions to the current Agreements are, the can is only being kicked further down the road. I have no information or prediction of what is yet to come. It is not clear that Blue Mountain Capital is currently the only party negotiating with KentuckyOne to buy its Louisville hospitals, or to what extent UofL will succeed in finding the money or a partner to take over (and at what non-financial cost). We are still wandering in the dark woods without even a trail of breadcrumbs to follow. Not all fairytales end well for their protagonists. Author P HasselbacherPosted on January 8, 2019 January 9, 2019 Categories UncategorizedTags Catholic Health Initiatives, Jewish Hospital, KentuckyOne Health, University of LouisvilleLeave a comment on UofL and KentuckyOne Agree to Extend Their Academic Affiliation Agreement Another Four Months. Our Unregulated Militia Is Killing Our Children. Special interest or public health issue? I cannot conceive that any health professional would consider the incidence of death and injury from firearms as other than a public health issue. Surely the absolute numbers of people killed or injured (in excess of 100,000 per year); whether self-induced or by others; by accident or on purpose places the matter squarely before us on a regular basis no matter where we live. This uninterrupted endemic parade of victims is punctuated by epidemic outbreaks in crowded places like schools or workplaces. There are carriers of this disease in all 50 states. No cure has emerged for this essentially American pandemic. The most recent outbreak which stimulated me to write this article occurred last month in Florida at the Marjory Stoneman Douglas High School in Parkland where 17 students were killed by another student, and 17 others wounded by an AR-15 military machine gun– a.k.a. assault rifle. The damage caused by this gun unnerves even hardened professionals. Unlike most other epidemics of disease, reliable information about how to prevent non-military people from death-by-bullet is scarce because of a bizarre broad governmental prohibition to even study the matter. The self-censorship is deafening in a recent 476-page report from the U.S. Department of Health and Human Services. It is titled, “Health, United States, 2016” but the words “gun” or “firearm” are not to be found in it. Disturbingly, it remains unclear that any meaningful national attempts to control this epidemic will be made or even that individual states will be permitted to do so. Undeterred, advocacy groups are increasingly demanding that immediate and definitive action be taken to protect themselves and the rest of us. Our young adults step forward. Author P HasselbacherPosted on March 14, 2018 March 15, 2018 Categories Uncategorized8 Comments on Our Unregulated Militia Is Killing Our Children. More Expensive Medical Services or Products Does Not Equate To Better. Author P HasselbacherPosted on February 13, 2018 February 13, 2018 Categories Uncategorized1 Comment on More Expensive Medical Services or Products Does Not Equate To Better. KentuckyOne Health Has Already Sold Most of Its Real-estate Assets in Louisville. KentuckyOne’s two acute care hospitals and its business operations in Louisville still remain on the sales block. Author P HasselbacherPosted on November 18, 2017 November 21, 2017 Categories UncategorizedLeave a comment on KentuckyOne Health Has Already Sold Most of Its Real-estate Assets in Louisville. The Search For A New President of UofL Must Be More Open. The University of Louisville is trying hard to recover from what can arguably be considered its darkest hours. It has, and is still weathering challenges to its accreditation at several levels. It has been turned upside down by a string of scandals that may yet lead to criminal charges. All of this has been well-reported publicly resulting in a community consensus that a lack of transparency and accountability at the highest administrative and governance levels allowed corrupt and abusive practices to fester for years. Where there should have been openness, there was deliberate obfuscation. It is against this background that the UofL’s Board of Trustees seeks to appoint a new President of the University using a process that could not be more opaque. Faculty members, some administrators, and students who have the most skin in the game are openly critical. I am too. Author P HasselbacherPosted on November 17, 2017 November 16, 2017 Categories Uncategorized1 Comment on The Search For A New President of UofL Must Be More Open. Just got 269 pages of documents with a summary. The summary supports previous claims of major financial mismanagement– if not worse. Oversight by Foundation Board was feeble if not inadequate. 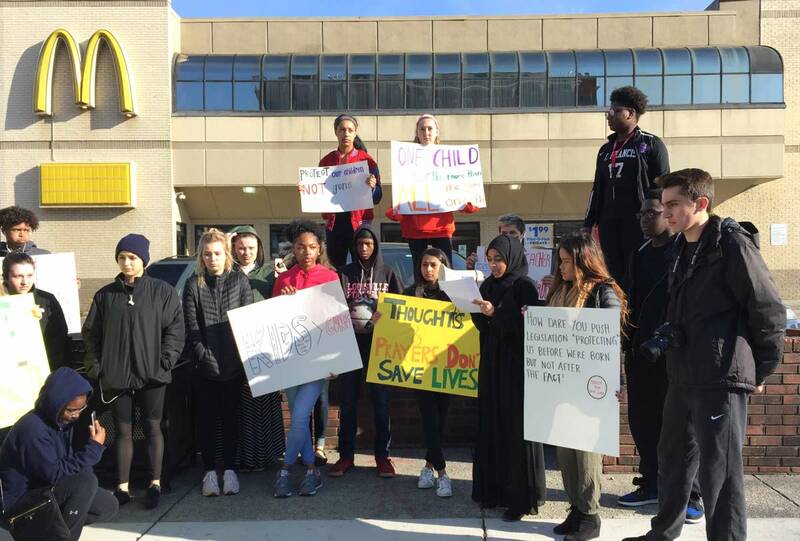 Ramsey supporters, enablers, and apologists, and shares blame with former President Ramsey and other University executives. The so-called elite, chardonnay swilling, trouble makers who dared rock the boast and ask questions are vindicated in spades. Statements by current UofL President and Chairs of UofL Trustees and Foundation affirm their commitment to transparency and emphasize that the report reflects the management of previous administrations and boards. Bad enough to put people in jail or to claw-back money? We’ll have to see. More when I dig into the details. Here is a copy of the entire document. (6.7 MB) What do you see that sticks out as either good or bad? The Executive Committee of the UofL Board of Trustees is assembling now. The executive committee can act for the whole. I predict it will vote on the relationship with KentuckyOne Health. It is likely the vote will involve severance of the joint operating agreements. UMC would then take control of the entire Hospital. From what I have heard, and because of recent financial events, I will be surprised if this does not happen. Tomorrow the State Auditor will announce the results of the audit of the relationship between the University and its Foundation. I understand that the audit will not be kind. We will soon know more. Drop In Value of UofL Endowment Confirmed. Endowment growth stalling compared to other institutions. Numerous earlier reports by Mr. Chris Otts of WDRB brought to the attention of the public information about financial dealings of enough concern that at least two major donors to the University of Louisville withdraw their support, triggering in large measure an intervention by the University of Board of Trustees to take a more controlling role in the University of Louisville Foundation and a full-scale fiduciary audit. This latter offers the potential to clear the air or to lead to even more troublesome revelations. Mr. Otts’s latest report deals with unauthorized spending of the University’s endowment by the Foundation in support of its commercial research, real estate, and other agendas both known and unknown. The result has been a substantial fall in the value of the endowment as its principal is consumed. Sparked by Mr. Otts’s use of information provided to him by the University as reported to the American Association of College and University Business Officers (NACUBO); and by comments made by Trustees Greenberg and Benz at last week’s meeting of UofL Trustees raising serious concerns about the endowment; I went to NACUBO’s website myself. Summary files for public use are available including the market values of the endowments of some 850 of the most important Colleges and Universities in the US and Canada from 1990 to 2015. 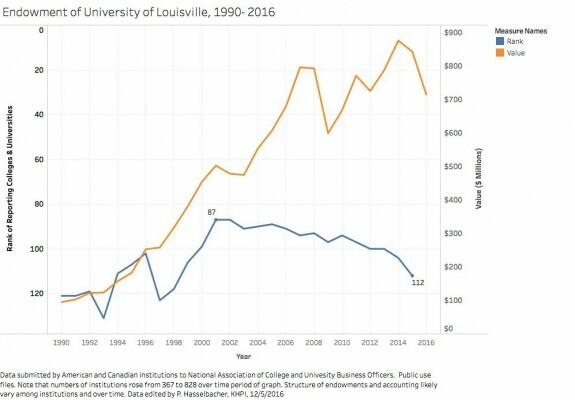 I abstracted these and plotted the market value of UofL’s endowment along with its rank among other institutions in this regard. Spending information or investment yields for individual institutions are not made available to the public, although summary statistics on aggregates in broad categories are available. A static image is presented below, and an interactive version revealing the underlying data is available. In summary, the amount of our endowment rose progressively from 1990 until around 2007 after which much volatility occurred to the point that the market value of the endowment in 2016 is indeed less than it was 10 years ago in 2006! 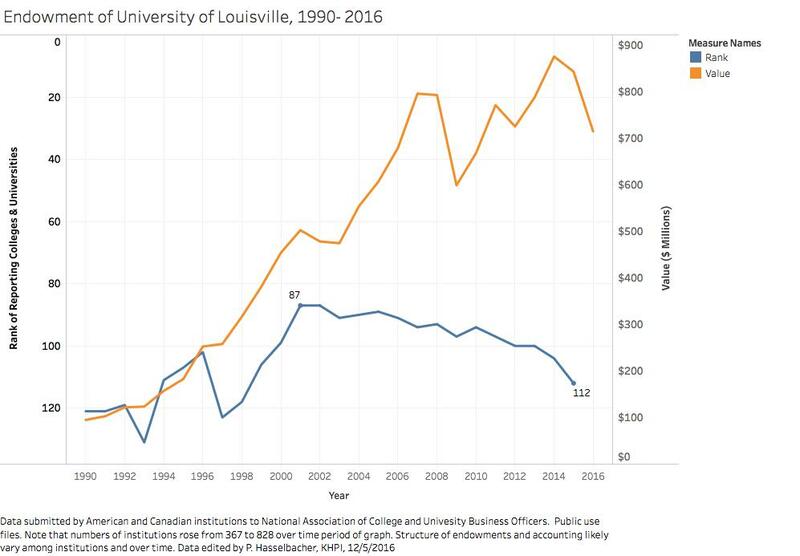 UofL appears to be eating its nest egg, and compared to other institutions of higher education, is losing ground in endowment growth. Author P HasselbacherPosted on December 8, 2016 December 9, 2016 Categories Education, UncategorizedLeave a comment on Drop In Value of UofL Endowment Confirmed. Credit Ratings for UofL, UofL Foundation, and CHI Downgraded. Author P HasselbacherPosted on December 1, 2016 December 8, 2016 Categories Uncategorized3 Comments on Credit Ratings for UofL, UofL Foundation, and CHI Downgraded. Ramsey Supporters on UofL Foundation Resisting Oversight by University Trustees. Author P HasselbacherPosted on September 23, 2016 December 9, 2016 Categories Uncategorized1 Comment on Ramsey Supporters on UofL Foundation Resisting Oversight by University Trustees.